Inspired and invited by Roughsea’s Art for arts sake (2) post, I gathered a selection of photos of pictures (taken for posterity in case the house burns down) which have found their home with the G.O. & I over many years, and each have their own story. This Japanese paper creation was the start of it for me. I found it at a market on Sydney’s Northern Beaches 20 years ago and paid $15. It hangs in our TA bedroom. This lovely came from the same Northern Beaches market for $8 and needed a clean up & small repair to the frame which I carried out with a butter knife, wall putty & house paint. It hangs over the TA kitchen fireplace. The gladdies was a $12 find a dozen years ago while diverting myself browsing [yet another] second hand shop during a stay at my ex-in-laws at Colac in Victoria. 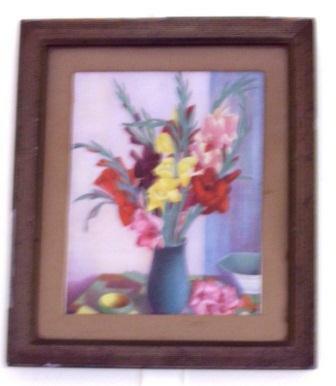 I didn’t bother fixing the frame, and it hangs in the TA kitchen to remind me of my Nanna’s garden of gladioli’s. The round picture was picked up for $20 on the way back to Sydney from a family reunion at Port Macquarie about 15 years ago when I stopped at a shed set off the highway at Coolongolook, operated by an interesting old bloke for many years as permanent garage sale, and was a great repository of treasures, junk and dust. It hangs also in the TA kitchen. 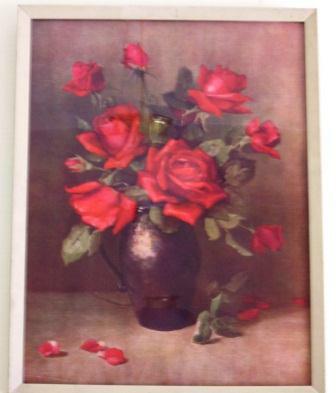 My red roses was a birthday gift from the G.O. a few years ago, spied by me in a trendy Glebe second hand shop window but at $60, not purchased. The G.O. snuck back and parted with the cash. Another one for the TA kitchen. Don’t imagine all these flowery things are only mine. This picture is the G.O.’s, and currently sits on his beside table in the Sydney apartment. He found it in a second hand shop in Newtown, and wouldn’t be dissuaded from taking it home. It’s grown on me. Something new! 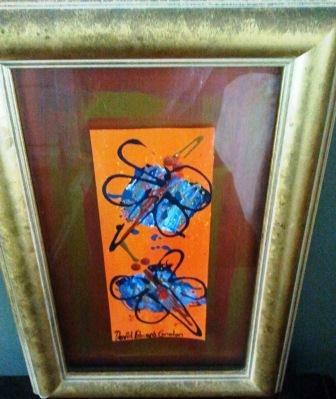 This piece was a souvenir from Broome purchased from the artist David Edward Conolan’s gallery. The G.O. was worried, I think, I’d leave him for D.E.C. (you will laugh if you click on the link & view the 4 page story), so much did I love the gallery I couldn’t be persuaded to leave. Only with the picture to take home could I be lured away. It sits on my bedside table. We have 3 of these in different forms. Anecdotally, they were decorative fibreglass panels crafted in the 1970’s in a factory unit in Blacktown by a old Italian man. The first one I ever saw was in a retro shop in Redfern in the form of a bathroom screen done in tiny fish, coral, starfish & seaweed, for $250. Fortuitously, when carrying out a demo the G.O. saved from the tip 3 similar pieces in a butterfly variation (we lied to my sister for a while that they weren’t real). We have another small piece and a wider screen that reaches to the ceiling. This one I ‘up-cycled’ into a floor light for the apartment by placing a lamp behind it. 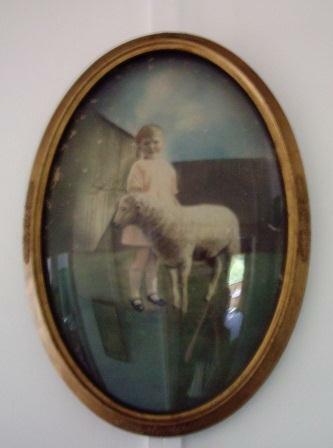 This is my Nanna & lamb picture, a tinted photo from the 1920’s. It hangs in the hallway at TA and looks over my side of the bed. Are you still with me?… Before I recount the history of the paintings, let me tell you the story of the couch. It’s a Night ‘n Day (folds out to a bed). My grandparents had a green vinyl version in the living room, and I had been searching for my own but to no avail. On a road trip north to a wedding in Tamworth in November 2009 we called in at a second hand shop in the not-even-a-village of Wingen. There it was. My Night ‘n Day. For $60. The G.O. wasn’t having a bar of it. There was no way we were buying that thing and carting it back to the apartment in Sydney where we had nowhere to store it anyway. So I cast it a reluctant glance, and spent the next 10 months wistfully reminiscing… “that Night ‘n Day at Wingen”. In October 2010 we decided to take the scenic route to TA via Tamworth which meant driving once again through Wingen. After a month of not-so-quietly ruminating, I began wondering out louder “what if it’s still there?”. Confident it wouldn’t be he later admitted, the G.O. said “just ring them”. Now by one those twists of fate, the shop owners are known to me from another life. I called… “Oh, yes, it’s still here. We put it out the back for the dogs to sleep on”. I paid the $60 with my credit card on the spot and let them know we’d be picking it up. 2 weeks later we whipped off the dog hair coated sheet, and it was perfect. The G.O. reluctant to admit he was wrong maintained his belief in its unattractiveness until he hung the paintings, also in the back of the ute, above it. Only then did he pronounced it worthy. 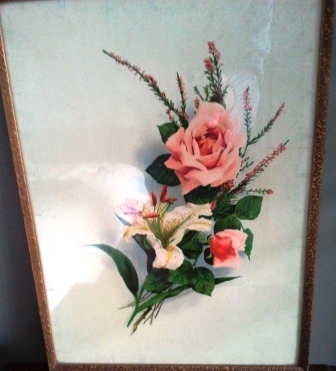 The paintings came from my grandparent’s farmhouse living room. From 1975 – 2010 they adorned the walls of my uncle & aunt’s living room, with me uttering very quietly to myself upon seeing them, “I’d wish I’d chosen those”… but at 9 years old, I chose a tall blue & purple vase which is still mine, and would be the first item I grabbed if I had to evacuate. In September 2010 I received a call from Dad who when it counts is quick on the uptake. My aunt was renovating and wanted fresh unadorned walls, so my uncle rang Dad to obtain details of the Murrurundi Historical Society. 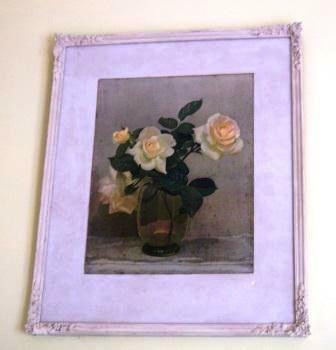 The paintings were painted in the early 1900’s by Aunt Emma on Nanna’s side who was a seamstress in Murrurundi, so my uncle thought they would be of local historic interest. They were. To me. Quick as a flash I was on the phone and organised to pick them up that weekend. So complacent had my uncle, aunt & cousins become that none of them wanted the pictures and were bemused I did. They now hang in the back room at TA. I think it was at this time my Dad christened our house “the museum”. 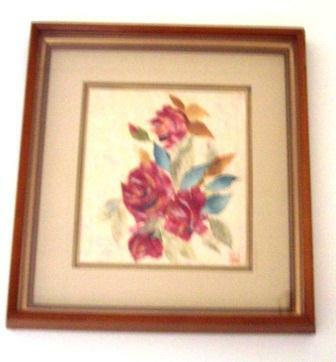 Does anyone else want to share something(s) special they have hanging on their walls, via comment and/or link to post? ** If you wonder about my taste, refer to About. This entry was posted in Blog and tagged Australia, family, humour, my life, my stories. Don’t you love goodies from job sites? although ours tend to be more practical than decorative, eg the plastic thing that goes in a bucket to ring out a mop. Diverse and fascinating selection there, love this post. Seeing other people’s art truly is interesting I think. When my cousin/godmother lived in Brazil she would come back every couple of years with butterfly wings in frames. I don’t know what happened to them, I think they ended up in a cupboard, unlike the copper ones in my kitchen. Thank you. I hope the Moroccan rug finds a spot unrolled one day. I really enjoyed putting the post together. I try not to be materialistic or have an attachment to things, and quite amazed myself by how much I walked away from in another life… but I guess I have to accept that it’s me, I love the old and eclectic. It took me a while to come to terms with the butterflies (was fascinated with the craft of the ocean theme panels but eeewww could never have them in my house) as I don’t like dead things especially as decor. Even looking at my post photos the G.O. said “the pink rose is my favourite” and he’s happy you agree. I really love the one of your nana and lamb with the old fashioned tinting. I have a few photos that my granddad did many years ago, and did try it myself but without much luck. I’ve an old portrat of Garibaldi, of all people. He was my Grandpa’s hero and the portrait hung in his room. Grandpa would lecture us about Garibaldi and how he united Italy. I see it now and cannot help but think of Grandpa and the scent of his Old Spice cologne. That is a lovely memory, of your Grandpa & hero Garibaldi, and that you have the portrait that you knew from your time with him, is wonderful. What a lovely idea to photograph your pictures. I´m a sucker for anything lavender or purple, so my favourite is the second one down, the one you repaired with a butter knife! Well done you! My walls, I suspect, show my ego, the walls are fall of my paintings, drawings, and photos, not much stuff from other people. It always seemed the cheapest way to decorate the walls, paint it myself. What a great idea for a post and a lovely collection. I really like Nanna and the lamb. Thank you. That picture was a great surprise when my aunt gave it to me as I don’t remember it. I also have hanging at TA tinted portraits of Dad at about 9, my Nanna & her sisters in their teens, and the G.O. as a toddler – sadly no original frames though. No photos of them which I must remedy. I love your Nanna’s lace. Stunning work. And she is adorable as a child in her picture too! I have a collection of old black and white photos on one wall surrounding a large framed 7 generation family tree done by my mum. I love your framed lace and the picture of your Nanna and the lamb, things like that are much more meaningful than anything new. I have just started using that nice long window ledge in our bathroom for my (as yet small) collection of old bottles. A new shop has just opened in our small town selling bits and pieces recovered from old houses that are being demolished. It is terrible, I can’t bear to walk past because I just can’t not go in, and if I go in I have to buy something! The framed family tree sounds wounderful as well as the old B&W’s. I love old photos & when I get time, will scan & reproduce some of ours and allocate wall space to them. I always think the same thing about old bits and pieces, what has this thing seen in its life? I want to give it a good home just so it is not tossed like rubbish. One of my old treasures is a bible. I am VERY not religious. But this poor worn thing was on a shelf with crappy romance novels and when I opened it the inscription was dated 1911 with christmas wishes to the receiver. I couldn’t leave it to moulder away with the Mills and Boone so I paid the few bucks to give it a warm shelf here. P.S. Best way to clean the insides of bottles? Thanks for that, I will give it a go. 🙂 I have a small Kays Linseed bottle that is too narrow to fit anything other than a pipecleaner into and it is still really clouded on the inside, driving me crazy! Roughseas did have a wonderful idea. Enjoyed your collection. That tinted lamb is precious. Question about the round one – how big is that? 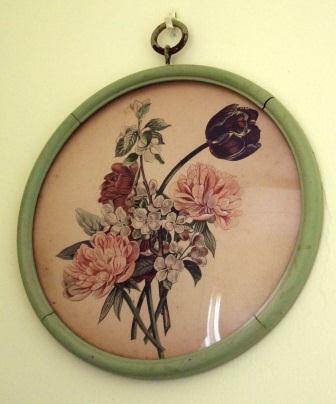 I have an almost identical flower picture in round frame – grabbed it when my grandmother’s place was emptied – it’s small but almost identical. My grandmother crocheted until her fingers wouldn’t cooperate – I remember her saying, I’ll make you something because this will be the last thing i will be able to crochet. I have several crocheted items in a trunk trying to protect them to hand down. Maybe framing is an option. Thank you. The round picture on the chain is about a foot in diameter. My recollection is we had crocheted everything, and as a child had the most beautful knit jumpers done by my Nanna. The G.O.’s mum crocheted he & his sister each a white bedspread & pillow shams – our’s is huge, heavy & intricate – saying the same thing. 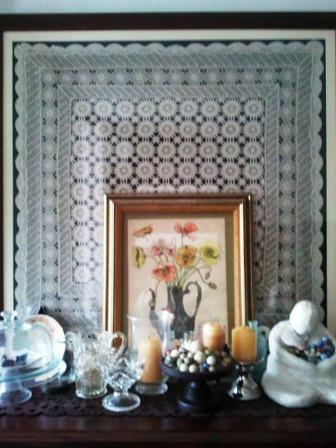 My tablecloth was in a cupboard for years until I saw a smaller piece framed. I hadn’t counted on the weight… I doubt it will ever hang on a wall but luckily the set up with the dresser works. In order to spare my family the pain of our home being turned into a museum, my junk (that I collect) now goes into a couple of display cabinets for resale at a friend’s country restaurant venue. What else could I do?? It was that or stop collecting. But each time I go to rearrange or restock I fight with myself not to bring it all home – but that is a post of its own. The old floor-board frames, which I picked up at a festival years back are left empty and when I fill them it feels weird so I take the pics out again. Any image distracts from the beauty of the frames. Few of our friends ‘get’ it – Loved reading about yours! The couch strory is a classic. When my husband complains about having to wait while I dash through a junk shop I remind him that other women have far more demanding and expensive habits, and anyway this makes me happy, to which he conceeds and settles down to read and wait….. Thank you. We’ve discussed getting to that point… of re-sale. We’d both love to have a second hand shop in our semi-retirement years but I fear we’d accumulate more than we sold. It is something we will have to consider when we combine our city and country household effects. I agree, it is an undemanding, and mostly inexpensive habit. I’m lucky the G.O. & I share the same passion for the old & interesting. Our only issue is both of us can cope with just limited time in dusty shops… but it may be a good thing for our bank balance. Ella, I love the shadow box of leaves. I can see it hanging in the living room, a conversation piece for all those who by chance look upon it. I am one of those “out with the old, in with the new” kind of people; except, however, when I am thrifting, or when it’s an heirloom. I can’t reconcile throwing away a piece of someone’s heritage; especially when that heritage is attached to mine. But because we have yet to move into a space of own own, we have not begun collecting/ much in the way of wall-art. I imagine once we do, though, we will begin the culling process.